Can't stand it when that happens mate. There's always people out there who want to ruin the deal for other - had it happen to myself on multiple occasions! Although thankfully, in most cases the sellers have been happy to go along with the deal. Shame that they took the sealed SMB out the deal but still a great price for £80 - were there any stand out games in the bundle mate? Mortal kombat 4 has sold on eBay. Was worried as next to no-one had even viewed it with an ambitious price of £17.99. Had an offer of £14 so snapped his hand off. Phew. After postage and fees that leaves me with £11.06. I also made a purchase; mario Kart double dash zelda edition via a Facebook game group for £20. Patiently waited with me £20 offer on the table till no1 else bit and he came down to my price from his £26 start. The bad news? Sleeve is pretty tatty and an ill thought out game of ‘who can open their post first’ with my workmate meant in achieving victory I dropped it on a hard floor, seemingly breaking the 2nd disc holders pins that hold it in the case. Doh! Gotta wait for an eBay £1 offer again and hope to get high £20s for it. Long story short. State of play; Cash: £16.06. Item to sell: Double dash zelda. Keeping: nowt yet. Very quick one from me - I swapped the DSi for Marvel vs Capcom 2 on PS2 in my mates shop. For now, this is going down as a game in the collection but if I get short on cash it might have to be sold. So I still have £15 and basically got this for a tenner (which I paid for the DSi). Finally got started today with these 3 bits. 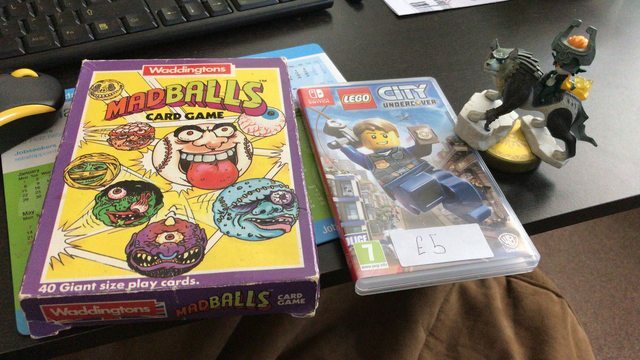 £5 on the switch game, £2 amiibo and 50p madballs. Keeping the amiibo and selling the other 2 bits. Nice wappersha, welcome to the fray. Went a car boot for the first time in ages, but was a bust, and talking to a game seller who witnessed several traders sweep up at 5:30am not sure i’ll bother again for a while. Also had a strange experience of buying ocarina of time for 7.50 on eBay, only to be refunded without reason 2 hours later, on an accepted best offer. Odd. I paid a total of £13.50 for all of these: Breaks down into £2 for the mics, £3.50 for the PS3 games and £1 each for the other 8 games. Going to keep the PS3, DS and Xbox 360 games as don't seem worth selling on at the moment and they have that "potential collectible" look about them. Got all the PS2 games already so they can go, torn on whether to keep Destruction Derby or not but for now it will go into the items for sale pile until I make up my mind. Wow n-g-m Good haul for only 13.50. I haven't played destruction derby for years. If I remember correctly I wasn't 100% struck by it. What do think about it? 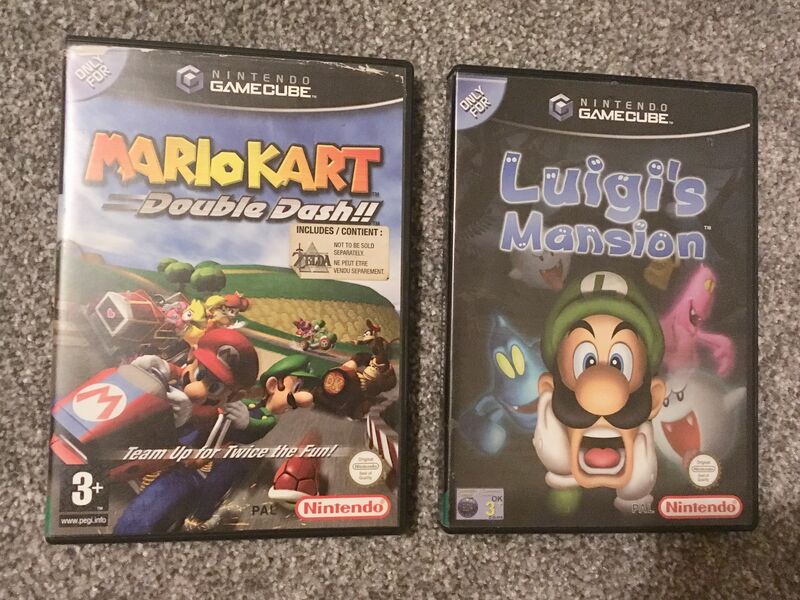 A snappier update from me; took an eBay punt on a stock photo luigis mansion, bit of messaging and I got a description and few quid off, so cost £14.40 and was complete and in decent nick on arrival. Leaves me with mario Kart/zelda, luigis mansion and a whopping £1.66 left. Been adding to my collection separately a lot recently so am worried, with a small and specific hit list, that I might not add much to my collection through this endeaver, as I’m snaffling up good prices as I see them. I'm finding the main difficulty is selling your items quick enough to raise cash to buy. Looks like half of us are stuck on less than £2 at the moment! I'm considering auctioning off that bundle I bought - minus what I'm keeping and see where we end up. I'll assume it will be less than if I was to sit on them and ask for BIN prices but it could free up funds much quicker and enable me to continue buying. It's a risky strategy but I wonder if it's one that could pay dividends? I could do a sale or two tonight as am going car-booting tomorrow. Unless I get lucky, I'm not going to find much for £1.50! I think we’re all doing pretty well ngm, for saying we’re less than a month in too. Much better than I expected anyway. Luigis mansion is definitely my go to this year for making small profits. Might swap the case but I reckon I can sell that for £23. Running joke at work when I get post, cos that’s probably the 9th or 10th copy I’ve bought this year. I’m a tight sod so gonna sit and wait for an eBay deal for a few weeks at least, play the long game. I reckon I’m close to doubling my money with what stock I’ve got so far. The quick sale small profit approach is very tempting, or taking the full 10% eBay fees hit. gingerraccoon wrote: I think we’re all doing pretty well ngm, for saying we’re less than a month in too. Much better than I expected anyway. I reckon you're about bang on with a double up on the two games you have - I reckon somewhere between £45-50 after fees possibly? They cost 50p each and I'm now officially spent up and have nothing in my budget until I sell some of those items! Brilliant to see everyone's pick-ups this week! I definitely agree that the challenge is going well for us all Unfortunately I also echo n-g-m's sentiments that the hardest part of this challenge is raising the cash back from pick-ups quick enough haha! Been a relatively slow week for myself however I have thankfully managed to sell some of the games. Metroid 2 (GB) sold putting £10.00 back into my budget alongside Super Smash Bros and Mario Party for a combined £40.00. Hooly555 wrote: Wow n-g-m Good haul for only 13.50. I haven't played destruction derby for years. If I remember correctly I wasn't 100% struck by it. I played it for about 20 minutes after getting it and I'm absolutely useless at it! The controls seemed quite clunky but that's not an excuse. It's now definitely in the selling pile to stay. I've put it with DD1 which I acquired yesterday for 50p and chancing the two of them at £15. I'll give it a week or so and might change strategy if there's no interest. I am now totally broke for the challenge and need to sell!!! Sold the Lego Switch game locally for £15 so i'm £10 up on that. Haven't' sold the card game, ngm, looks like i'll probably keep it haha. Did you mean £10 each or both games for £10 altogether mate? I have had a welcome sale to give me some money to now spend. Street Fighter Ex3 went on eBay for £10 so after fees and postage I cleared £7.50 so that's what I have left to spend now for this challenge. To make this sale possible I had to quickly sell my last remaining game - Mario Golf. Sold it through Facebook for £7.50 gifted + post so that put £7.50 straight back into my budget. I already own the six games to sell so i'm hoping their sales will get me back up to around the £50 mark!